The opening installment in Rick Riordan's newest series about the children of gods does not disappoint. The series are beginning to feel formulaic - a child is thrust into a new world populated by mythical beings, meets a dedicated group of friends within the mythical world, goes on a quest, and saves the world. But it's still incredibly entertaining. Magnus Chase is the new protagonist, son of the Norse god Frey. 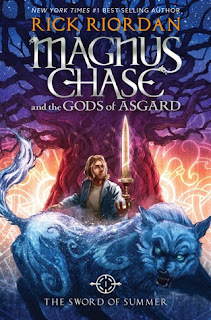 Unlike the heroes of earlier series, Chase dies before he enters Valhalla, the mythical resting place for those preparing to fight in Ragnarok at the end of days. Like previous series, Chase learns of his parentage and embarks on a quest. His quest is to locate a weapon that will play an important role in Ragnarok. I give Riordan credit for his commitment to diversity in his books. In this series we see a homeless protagonist, a deaf elf friend, and a Muslim Valkyrie. (The book doesn't get into the mechanics of how one's religious beliefs are impacted by the discovery of an active pantheon or four, possibly because it's a children's book and such explorations could get pretty heavy pretty quickly.) Like the previous series, Riordan has set up a larger battle that will continue throughout the series and the audio narration is impeccable. Plus, bonus points for Annabeth's appearance as Magnus's cousin - hopefully we'll see more crossovers as the series continues. Verdict: Affirmed, if you're a Riordan fan. I like learning about various pantheons through Riordan's inventive tales. Aside from the mythology involved, this series doesn't stand out from others. If you enjoyed his previous books, this will be no different. "The Sword of Summer" by Rick Riordan, published October 6, 2015 by Disney Hyperion. Audio narration by Christopher Guetig, published October 6, 2015 by Listening Library.